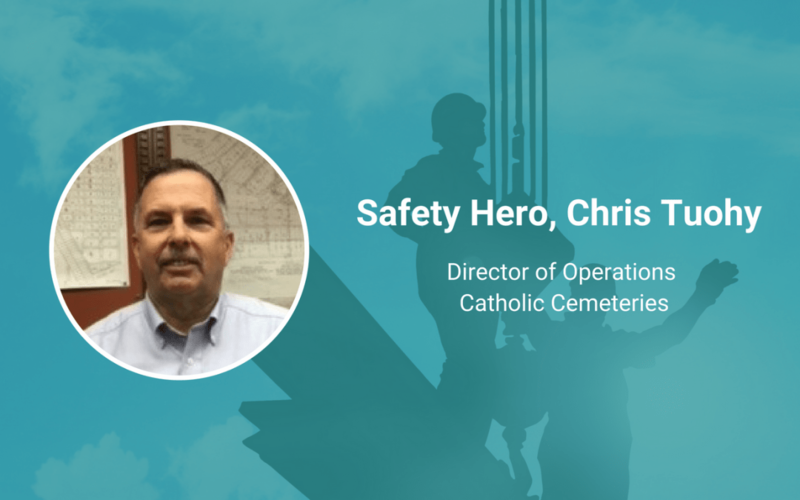 “Safety is a part of all of our work every day,” says Chris Tuohy, Director of Operations at Catholic Cemeteries. “When your staff address it that way, it really makes a difference,” he says. Catholic Cemeteries is an organization owned and operated by Saint John’s Cemetery and affiliated with the Diocese of Brooklyn. There are four cemeteries under Tuohy’s watch: St. John Cemetery in Middle Village, St. Charles and Resurrection Cemeteries in Farmingdale, Mount St. Mary’s in Flushing, and Holy Cross in Brooklyn. Each day you can find Tuohy taking on a variety of projects at Catholic Cemeteries. At the end of the day, he’s not only helping staff—but people visiting the cemetery—to stay safe by exercising caution, being aware of sinking hazards, and being as educated as possible on the safety way to walk through cemeteries. Why did you choose your profession or how did you end up in your role? I started out as Grounds Maintenance Foreman 39 years ago and then managed one of our cemeteries and was promoted to Director of Operations in 1996. I quickly learned that this was a great opportunity for me to work with staff in many different roles and accomplish different projects almost every day. To be involved with your staff and understand their true needs. Many times different issues arise big and small and as a group we work them out. In more difficult situations, when they are resolved, I have had satisfaction to know that together we can take care of anything. Safety is a part of all of our work every day, and when your staff address it that way, it really makes a difference. To look at whatever needs to be accomplished in a calm manner, and using previous experience so that, regardless of how difficult it may seem, we can get through a situation.